Come one, come all to the third installment of Fourth Wave's interview series with feminist bloggers and thinkers (the first two interviews can be found here and here and the next will be up April 10th). 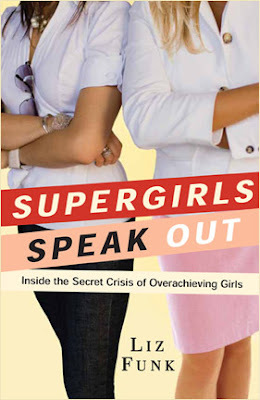 This month, I interviewed author Liz Funk, a senior at Pace University whose first book, Supergirls Speak Out: Inside the Secret Crisis of Overachieving Girls , just hit the shelves! FWF is thrilled to have Liz join us as part of her virtual book tour (click on the link to to check out other blogs she has and will visit over the month of March). And, as part of the promotion for her new book, I'll be posting contest details tomorrow -- you could win a free copy! In the tradition of bestsellers, such as Ophelia Speaks and Quarterlife Crisis, Liz Funk’s Supergirls Speak Out sheds a disturbingly bright light on a condition that is spreading quickly from Generation X to Y—and even to little girls. Funk calls this being a “Supergirl,” i.e., a girl who believes that in order to be happy, she must excel at her job or career, have the best grades, wear the coolest clothes, date the best-looking boy, and have the perfect body size. And now, without further ado, the author of Supergirls Speak Out , Liz Funk. 1. In your book, there seems to be a tension between the term “Supergirl” as a positive qualifier—Supergirls being high-achieving and smart and pretty and wanting to go places—and the Supergirl phenomenon as a negative thing—girls and women who are overachievers, who have a constant need to be perfect at everything, often to their own detriment, and who have an overwhelming and stressful desire to be at the top of their game at all times. And I wonder if, to start off this interview, you could talk a little bit about the connection between the positive and negative aspects of being a Supergirl and how one might negotiate those tensions? Great question. Overachieving girls themselves aren’t a “secret crisis”—it’s the consequences that accompany overachieving, and achieving for the wrong reasons, that’s the problem. I’ll be the first to say that girls should reach for the stars and go for their dreams; after all, we need go-getter girls if we want more presidential candidates and women in business and women as public intellectuals, et cetera et cetera. The key is, we want young women to aspire for success for the right reasons. If girls are achieving because they’re looking to matter or to feel valuable because they don’t feel like they matter on their own, that’s the problem! 2. Okay, so it's not about achieving, but achieving for the wrong reasons. For your book you interviewed (almost) a hundred girls and women about their experiences, but you also rely on your own experience. And here you are: you’re only 20, you’ve just published your first book, and you’re about the graduate from college; you’ve arguably accomplished more than many people your age! How do you fit yourself into the Supergirl narrative? You’ve mentioned that you’re a “recovering” Supergirl, but what does that mean to you? Do you feel that by “recovering” you’ve overcome some of the negative aspects of being a Supergirl or do you feel it’s something you struggle with on a daily basis? I truly believe that for any young women to get over being a Supergirl, she needs to have a mental meltdown of some degree and confront why she is working so hard and going so hard on herself. Personally, I had that mental meltdown my junior year of college and was really forced to take a second look at how I was living my life and why I was trying to find myself in my work and how others perceived me. Now I try to make more time for myself and one of my new year’s resolutions was to get more hobbies and to stop being fake—so I’m definitely still a work in progress. I try to be in a constant conversation with myself about whether I’m going too hard on myself, and I work to be mindful and live in the moment and not go into everything with really high expectations. That’s the worst part of being a Supergirl, I think: everything is disappointing. Being a “recovering Supergirl,” who can be open to exploring the wonder of life, is much more fun! 3. So, what made you decide to start researching Supergirls? Was it your own experience? The experience of your friends? A combination of things? And where did you come up with the term itself? Growing up, I was always observing the girls around me trying to look like perfect 10’s—pretty, talented, smart, charming, desirable—who made this all look easy. However, occasionally the token “perfect girl” in high school or college would have a breakdown, and it would get people talking, saying things like, "Wow, I thought she was perfect." I wanted to look into these girls’ secret lives. And although I didn’t become a full Supergirl until my later years of high school and college, I definitely spent my whole life investing my identity in superficial things, like my weight, and my relationships with guys, and my career. Also, in 2006, Girls’ Inc. released a study called "The Supergirl Dilemma" that found that overwhelming numbers of tween and teen girls felt pressure to be perfect, and Duke University had done a similar study on college women not far before that, so I really wanted to do a broad study of the lives of overachieving young women between the ages of 13 and 30 and see what their lives were like. 4. And once you decided to write about Supergirls, how did you actually take those next steps to negotiate a book contract and set out to do your research? You talk a bit in the book about doing a lot of networking, but can you be a little more specific about what that networking looked like and how you came to meet the right people at the right times? I moved to Manhattan in September of 2006 and was really determined to meet other women writers, magazine editors, and young authors so I could learn more about how to make a writing career a reality. I was always really proactive about writing to authors who I like and asking them to have coffee or lunch with me, or reaching out to writers whose articles I read regularly in publications I liked. Gloria Feldt, the former president of Planned Parenthood, has a really good saying that has sort of been a guiding light in my career, which is that it never hurts to ask! 5. Great advice! I have a quick question about one your Supergirls, Yolanda, who, at 27, is one of the older women you interview. In reading the book, I didn’t feel that she quite fit the high-anxiety mold occupied by most of your other high school and college-aged subjects. She seemed pretty put-together and had pursuits and hobbies outside of work. Do you think there might be a generational factor for Supergirl-ism—i.e. is it something more prevalent among girls and women who grew up in the 1990s and early 2000s? If so, why do you think that might be? Yolanda was definitely on the chill side of the Supergirl scale, but I do think that she’s a great example of how overachieving young women can confront the pressure to be extra-sensitive and please everyone, and excel in the professional world. There definitely may be a generational factor—that the younger girls in Generation Y, like my age and younger, are a bit more high-strung than our big sisters—but I also think that it might be a geographic thing. Yolanda went to high school in Austria and college in Canada, so I think that she missed the U.S. hothouse effect, in that we raise our girls to be a bit hyper-active and hyper-sensitive as they pursue their goals. You’re right, though: although Yolanda was really successful and beautiful and charming, I do think that she expressed less aggressive Supergirl traits, because she was older and was comfortable in her skin and had already done a lot of the negotiating and learning about herself and her femininity that younger Supergirls in the office struggle with. And I think she had a lot more confidence than your average Supergirl… but she was still a total wunderkind banker. 6. In your chapter on feminism, you make a comparison to Betty Friedan’s The Feminine Mystique, arguing that the desire of contemporary women to do and be everything mirrors Friedan’s 1950s housewife who supposedly had everything she could ever want but was still discontent. What other aspects of earlier waves and generations of feminism do you feel warrant a second look vis-à-vis contemporary society? How do you, personally, negotiate the past while embracing the future of feminism? I think feminism is cyclical, and when we don’t fully resolve issues, they come back again in different forms. Personally, I’m rather worried that we haven’t resolved the “raunch culture” issue and the “faux empowerment” issue that a lot of people were talking about a few years ago, especially in 2005, when Ariel Levy’s book, Female Chauvinist Pigs: Women and the Rise of Raunch Culture debuted. I feel like a lot of women dismissed Levy’s argument as condescending and chose to ignore this issue—that young women see their sexuality as currency to be traded for power and validation—and I predict that this problem is only going to boomerang back and get much worse if it’s not confronted. After all, if feminists—who care the most about women!—don’t take this on and have a calm-cool-collected conversation about how women see empowerment, who will? Outside of psychotherapy and Jamba Juice, feminism is the only proven method to help women live happier, healthier lives. Naturally, I’m kidding. A little. 7. As you mention in your book, a lot of young women today resist the feminist label. Do you have any thoughts about why this might be? And did you encounter any resistance around feminism from the girls and women you interviewed? What’s funny about Generation Y and the Supergirls is that they seem to have no problem with the idea of feminism—most young people who I’ve met are totally open to women having equal rights and equal power, and many girls are eager to talk about the ways that they feel discriminated against and in a disadvantaged position. It’s the word “feminism” that people don’t like. And I really don’t have a solution, other than to encourage the girls who don’t want to use the word “feminism” to keep living feminism. For example, my freshman year of college, one of my friends took down all of the posters that the fraternities and sororities were putting in the dorms and wrote “GREEK LIFE HURTS WOMEN” on them in a big marker and hung them back up—which is a totally radical thing to do—and she didn’t consider herself a feminist. And I think with people like that, rather than arguing with them about the semantics, it’s better to just appreciate the shared sentiment and find commonalities. I mean, it’s sad that girls don’t want to shout “Yay feminism!” from the rooftops, but I’m glad that they are invested in protecting feminism’s legacy, even if they wouldn’t explicitly say that they are. 8. And what made you personally decide to identify as a feminist? Is it something that happened organically or was it a label you took on after some thought and/or trepidation? Do you have a feminist “coming-out” story you’d like to share? It came about really organically. I first became interested in gender equality in middle school, and in the eighth grade, I did a project on Betty Friedan for social studies class and was like, “Oh, I guess I’m a feminist.” It wasn’t a huge deal or anything, it felt very natural to me. I was twelve, and I actually thought it was kind of cool! At that point in my life, I wanted to be the American ambassador to France, and I knew that I was going to need feminism if I wanted to make that happen. Since then, I’ve changed career goals, but I’m still a feminist. 9. Obviously, over-achieving and perfectionism can become all-consuming, obsessive and difficult-to-abandon pursuits. How do you recommend girls wean themselves away from the need to be a Supergirl? What’s a good place to start? Young women need to realize their intrinsic worth. They need to figure out why they matter outside what they look like, how others perceive them, and what they’ve accomplished. They need to have a relationship with themselves, where they like listening to their thoughts and spending time alone with themselves, where they don’t berate themselves. Naturally, that’s a huge task to take on, but it starts with giving yourself some free time, spending solitary time by yourself to think and meditate, and treating yourself! A big part of this is cutting down on our use of technology; iPods and PDAs and text messaging are really distracting, and they keep young people from being able to listen to their internal monologues and have downtime during the day. But having that relationship with yourself is how you have a sense of self-worth! 10. Excellent, I always love an excuse to treat myself! So, downtime is essential, and you say that a symptom of being a Supergirl is a constant need for occupation, the unwillingness or inability to relax and just enjoy life. So, as someone who’s “recovered” and advocates taking time off, what do you like to do for fun? What do you find helps you unwind after a busy day of classes or writing? And, last but not least, what are you going to do once you graduate in May? I watch so much television! I love 30 Rock, How I Met Your Mother, and Arrested Development—I am nearing memorization of the latter. I also love to paint and to read novels and to play the oboe; it took me about two months of daily practicing, but I can play the musical “Spring Awakening” from start-to-finish on the oboe. I’m not sure whether that’s cool or embarrassing. Ha! I’m not 100% sure what I’m going to do after graduation in May; I know that I’m going to have a pretty chill summer (assuming I pass all my classes; in a truly un-Supergirl move, I have a MAJOR case of senioritis right now)—I want to finish writing the novel I’ve been working on for a year and read lots of books. Then, I think I’m going to move to Los Angeles; “move somewhere warm” is very high on my priority list, and I’m trying to take my own advice from “Supergirls”—taking risks, being unafraid to make mistakes and face trials, and being open to exploring the wonder of my life! Thanks, Liz, for the great interview. I'm sure we all wish you luck in your future endeavors! P.S. to FWF readers: Don't forget to check back tomorrow for details on how to win a free copy of Liz's new book!